The BD-2 Blues Driver compact guitar effects pedal is the perfect way to get that coveted thick and creamy blues sound, with just the right amount of crunch. Establishing itself as one of the most popular pedal in Boss' stompbox family, this delightful little beauty offers a quick route to a warm overdriven tone that breaks up in just the right way, a characteristic that is reminiscent of classic tube amps. 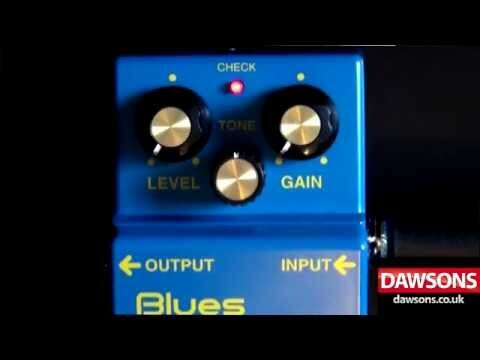 As with all Boss compact pedals, the Blues Driver is very easy to use. The connections offered are a single input and a single output jack on either side of the chassis. There are three control pots: LEVEL, TONE and GAIN. The LEVEL control allows you to attenuate the level of the effect against your dry guitar signal, so that when you initiate the effect, it comes at the level you desire. The TONE level adjusts the affected frequency levels so that you can aim for a fat, low thump, a powerful mid range punch, or a brittle yet bright high end slap. The GAIN pot allows you to dial in the perfect amount of bite, allowing you to go for subtle Hendrix-style fuzz to an all out desert rock barrage. Don't be fooled by the name "Blues Driver", players from any genre will appreciate the subtle tube-style warmth offered by this divine little box. Whether you're picking up the guitar for the first time ever, or regularly tour as part of a professional band, reliable and sturdy gear is a must. The Boss stompbox design is often copied but never equalled. As we've come to expect from the team at Boss, the BD-2 Blues Driver is built like a tank and tested to destruction. No matter how aggressively you treat this pedal, you can rest assured that you'll wear out before it does.